Vermont is a mecca for the craft beer community on the Northeast. With so many highly-touted breweries it's easy to let some great beers slip through the cracks. 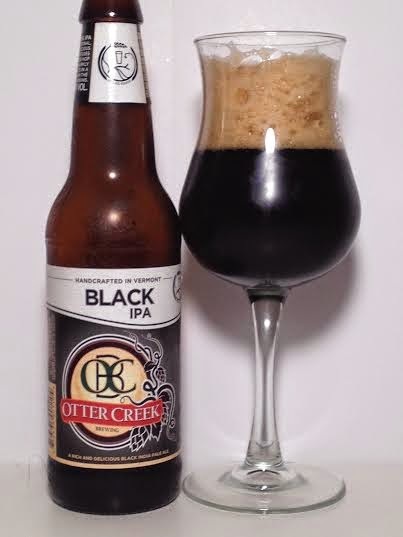 I first remember having Otter Creek Black IPA almost two and a half years ago at a beer tasting and it was one of my favorite's of the day. I have never actually had it since, so this was pretty cool for me. Black IPA's are hit or miss due to the taste being either too black (malty) or too IPA. Thankfully Otter Creek has found the right blend of both worlds. The aroma is a flood of roasted malt and plenty of hops. Neither of which overpower one another. A few sips in, you are hit with a combination of pine needles and juicy hops. A strong roasted presence is backed up by a citrusy, orange juice flavor. A very subtle, almost iced coffee bitterness on the finish along with that big, hop presence. It has a fluffy mouthfeel that goes down smoothly. Easily one of, if not the best black IPA's I've ever had. It is such a robust beer for the style and almost stout-like with it's roasted qualities and fluffy mouthfeel.